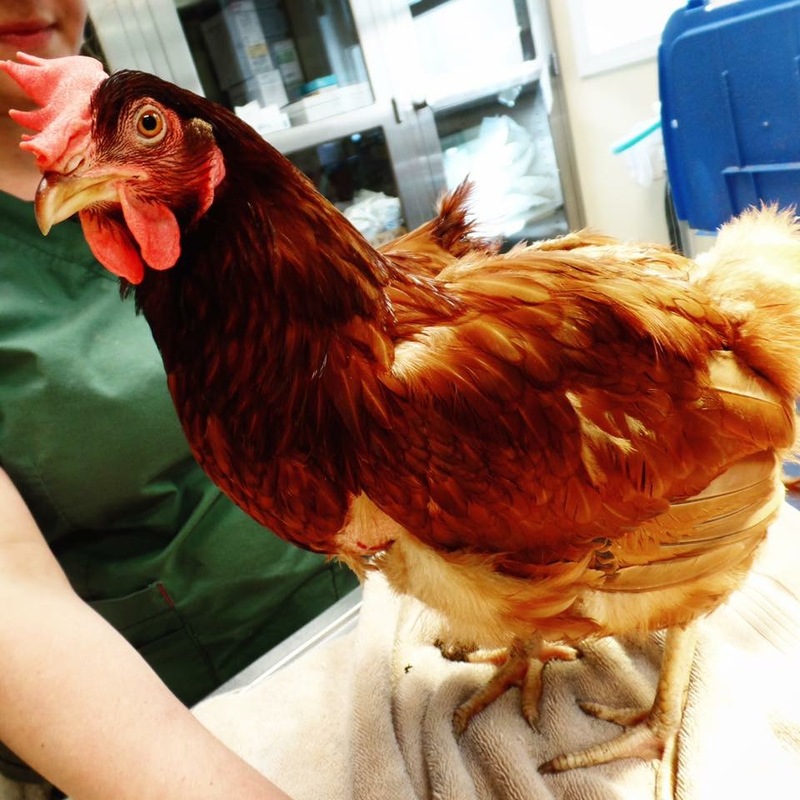 Henrietta is a 1.5 year old female Rhode Island Red. She lives with a small flock of hens kept as pets by a local restaurant in Maryland. The chickens are allowed to free range on the property during the day and at night put themselves up in their chicken coop. However, early one morning in late May, there was a fox attack on the chicken coop. By the time the flock’s owners arrived at the scene, four of the birds were missing, and Henrietta was found hiding in the corner. Fortunately, she had survived the attack, however she appeared to be in weak condition and had visible injuries on her back. Her owners were concerned, as they knew that without medical care, Henrietta might well be the fifth of the fox’s victims. Therefore, they immediately called to make an emergency appointment with their veterinarian, Pleasantville Animal Hospital of Fallston. 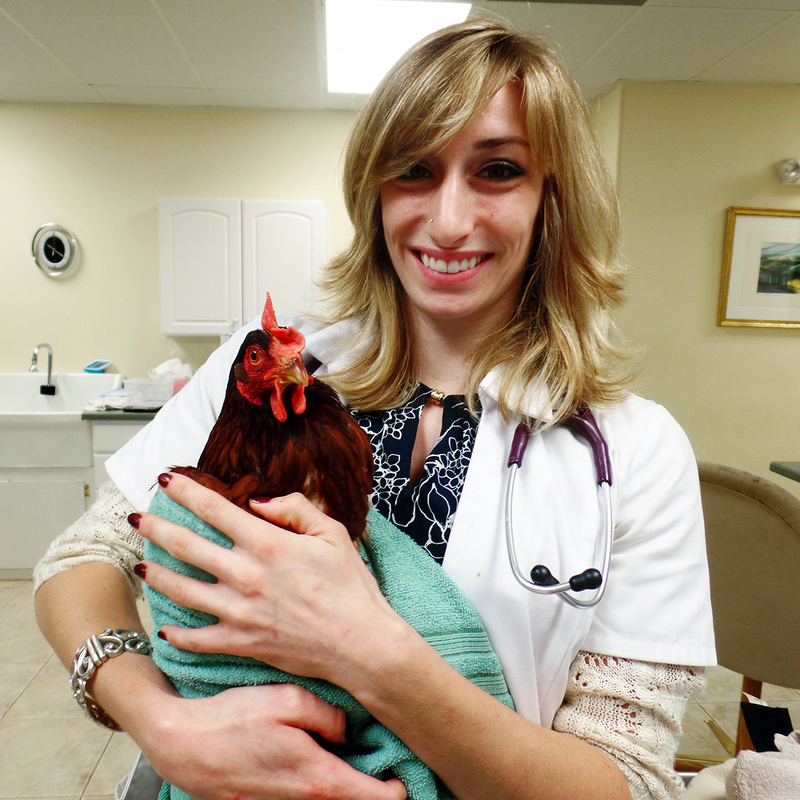 Henrietta was brought to Dr. Rebecca Gounaris at the Pleasantville Animal Hospital of Fallston. Upon arrival, Dr. Gounaris performed a physical exam on Henrietta to assess the extent of her injuries and her overall health status. Behavioral-wise, Henrietta was definitely more quiet and subdued compared to a normal chicken, but was still alert and responsive. The attack had resulted in the loss of large patches of feathers, especially on her back. She had three significant open wounds between her shoulders, on her back, and hip. Superficial scratches were noted on her chest, back, and around her vent. Dr. Gounaris flushed Henrietta’s open wounds liberally with dilute betadine solution and sutured them closed. Since most predators of chickens, including foxes, carry a lot of bacteria in their mouths and under their nails, Dr. Gounaris was concerned about the possibility of a secondary bacterial infection leading to septicemia (a very serious blood infection); therefore, she immediately started Henrietta on Augmentin (amoxicillin and clavulanate potassium), a type of antibiotic that acts similar to penicillin. Supportive care - Henrietta should be kept inside and separated from the rest of the flock while she recovered from her injuries. This location should be somewhere safe, quiet, easily accessible, and in a low stress environment. Keep a close eye on her, especially the first 24-48 hours – Henrietta’s prognosis was guarded during this time, not because of the wounds but due to the risk of septicemia from the bacteria in the fox’s saliva. 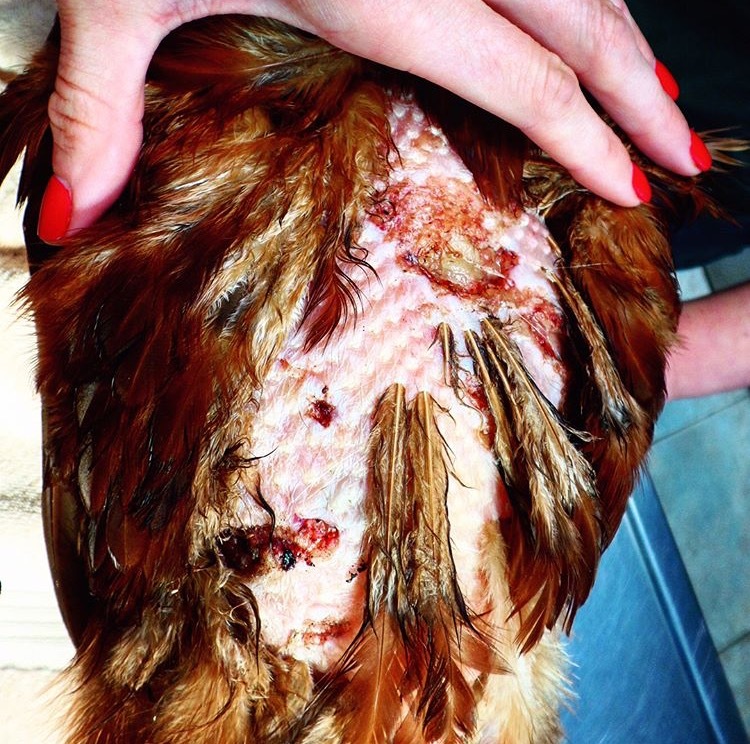 Antibiotics - Henrietta’s owners were instructed to administer 125 mg/kg of Augmentin to the hen, by mouth, every 12 hours. Anti-inflammatory Medication - Henrietta was also prescribed 2.5 mg/kg of Metacam (meloxicam), a non-steroidal anti-inflammatory (NSAID) drug, once a day by mouth, to help control pain and inflammation. Egg withdrawal time - The egg withdrawal time for Augmentin/Clavamox is normally 14 days (2 weeks), but is prolonged to 6-8 weeks for anyone that is allergic to penicillins. 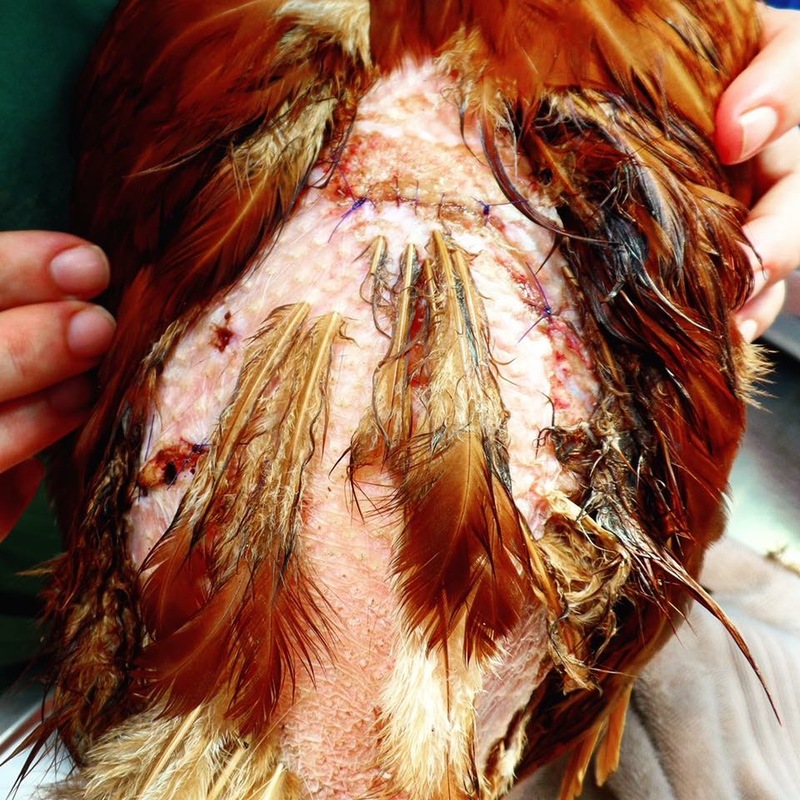 Since Henrietta’s eggs may potentially be sold, and whoever buys them could potentially be allergic to penicillins, it is important that Henrietta's owners follow the more conservative withdrawal time. Twelve days following the fox attack, Henrietta saw Dr. Gounaris again on her recheck appointment to remove her sutures. 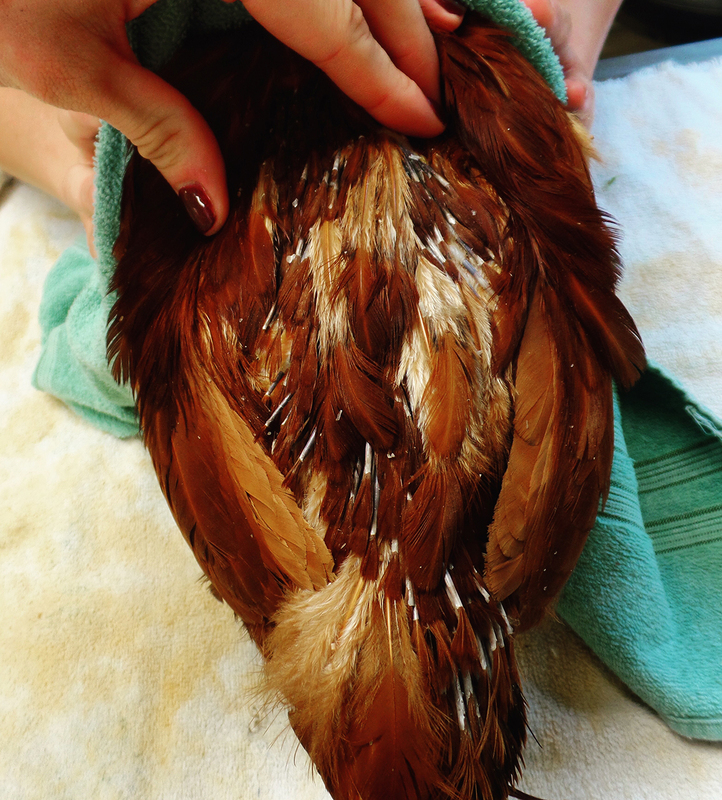 All but one of the wounds were healed, and several pin feathers were starting to come back in. The one wound that was having difficulty healing was debrided again by Dr. Gounaris and re-sutured. Henrietta was otherwise in good health, and on the path to recovery. Her owners are re-evaluating the design of their coop and are planning to install additional predator proofing to keep the chickens safe before putting Henrietta back outside. Pleasantville Animal Hospital of Fallston, located in Fallston, Maryland, is a family-owned, full-service hospital that provides veterinary services for dogs, cats and birds. Their expertise in the field now spans over three family generations, and they are very proud of this unique heritage. The hospital has an in-house laboratory, allowing for rapid diagnostic testing for critical care patients, digital radiography (xrays), surgical suite, and an on-site pharmacy. Dr. Scott Gounaris has been practicing veterinary medicine for 35 years and founded Pleasantville Animal Hospital in 2002. His daughter, Dr. Rebecca Gounaris, now works alongside him, and they approach each case as a team. Dr. Rebecca L. Gounaris is a 2016 graduate of the Virginia-Maryland College of Veterinary Medicine and is Dr. Scott Gounaris's oldest child. In addition to her lifetime love for cats and dogs, she has a deep passion for birds and participated in externships at several exotic veterinary clinics during her senior year. She has also worked for many years at Tri-State Bird Rescue & Research in Newark, DE, starting while she was earning her undergraduate degree at University of Delaware, and continues to provide veterinary care there to wild birds in need. After spending much time away from home for her education, she is thrilled to be practicing medicine back in her hometown and alongside her family members. 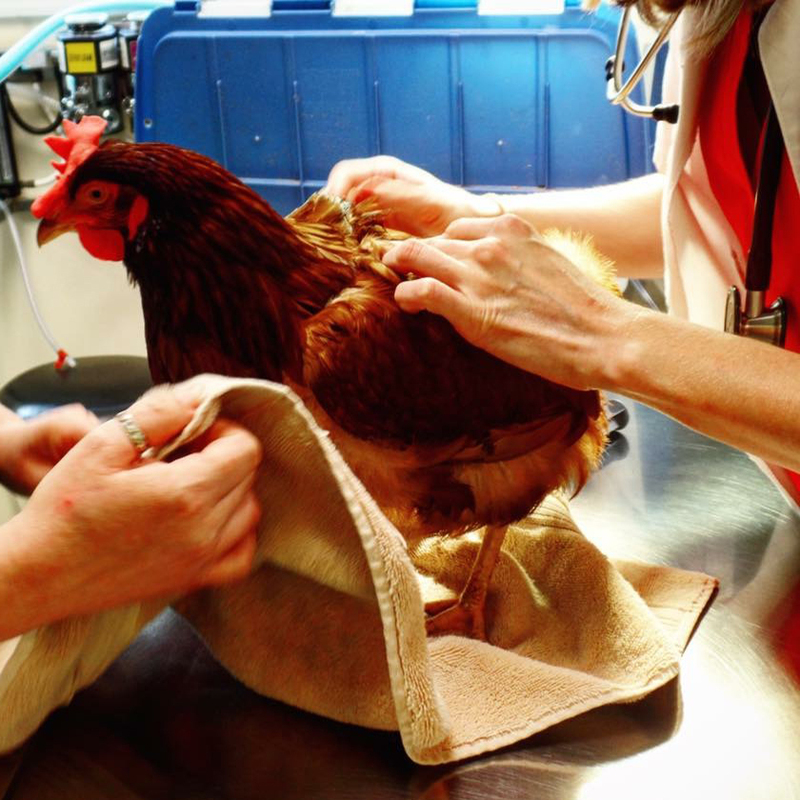 She is a member of the Avian Association of Veterinarians, American Veterinary Medical Association, and Maryland Veterinary Medical Association. She also competes in synchronized ice skating and has two cats, Arwen and Pippin, a Sun Conure, Nino, and a Green-cheek Conure, Dutch. Dr. Scott Gounaris graduated from the University of Florida Veterinary School in 1982. His lifetime love for animals drove him to choose veterinary medicine as he wanted to help animals that could not help themselves. Dr. Scott Gounaris enjoys the teamwork that we and the pet owners employ to work together for the welfare of their pets. The greatest reward for him is a positive outcome for his patient and their owners. With over 40 years of experience in the veterinary field, Dr. Scott Gounaris has seen it all. Prior to opening Pleasantville Animal Hospital of Fallston, he worked for his father, who was also a veterinarian. Now the father of a recent veterinary school graduate, a current veterinary school student, and a college undergraduate, he has shared his love of the profession with the next generation of Gounaris doctors.